As a documentary on the horrors of war plays on a TV, the camera pans a drab living room, finding a man asleep upright on a sofa. He wakes to realize he’s wet himself. He is Isaac. Isaac is a lemon. The documentary Isaac had slept and peed through provides the context for a story in which one man can so obliviously wallow in self-inflicted misery. In quick succession, Isaac will dismiss what his (randomly blind) girlfriend Ramona (Judy Greer) has to say before publically humiliating a female student (Gillian Jacobs). Both are too focused on themselves. Why aren’t they focused on him? 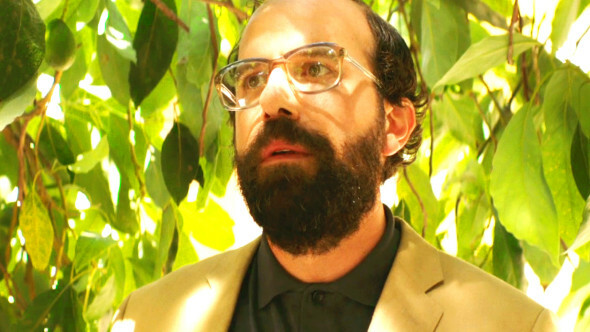 Co-writer Brett Gelman plays Isaac, a send-up of sorts of the self-pitying hero of so many indies. Director/co-writer Janicza Bravo borrows and rebrands independent film stylizing – from Wes Anderson to Jared Hess to Todd Solondz – to deliver a wry satire of the quirky worlds they create. Her framing, color palette, set design and timing offer spot-on re-renderings of the atmospheres created in a generation of arthouse movies that follow the unraveling lives of misunderstood, entitled outcasts. Bravo peppers the film with a handful of perfectly discordant scenes: Isaac running up a road with a stroke-impaired old woman in a wheelchair; Isaac awkwardly threatening and then kissing Michael Cera; Isaac and his profoundly dysfunctional family participating merrily in a rendition of the song A Million Matzoh Balls. Individually, these scenes are amazing. Truly. But they don’t string together to form a cohesive image or a compelling narrative. Gelman’s intentionally weird and flat performance engages, in a trainwreck sort of way that suits the effort. You believe him. And many – most – of the performances around him are clever, individual and memorable. Their interactions and the story, slight as it is, strain the imagination, though. Nia Long’s Cleo, for instance, seems included solely to allow for a new series of awkward moments. Long’s performance rings true, from her friendly introduction through her polite if wearied response to Isaac’s racist flirtation. Her actions, however, defy logic in a way that exposes a narrative weakness you’re less likely to find in the films of Anderson, Hess or Solondz. Todd Solondz knows what to do with an unlikeable protagonist. You won’t enjoy it, but he will not pull any punches and you will have closure. This is the problem with subverting the work of superior filmmakers – your film invariably suffers by comparison. Which is not to say that Lemon has nothing to offer. It offers a pantload of intriguing character work and suggests the vision of a worthy director. The script just needed another draft.